TESLA Motors - as covered and photographed for you, by the IN show. Newport Beach, CA - We all know that a picture is worth a 1000 words. Sometimes, that picture needs to be placed in context, and only a superb narration will do. 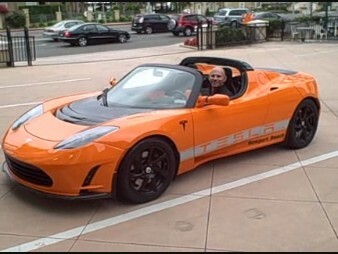 Finally, enjoy our broadcast as we talk about the TESLA company, the usefulness of going green in your driving habits, and that one-of-a-kind test drive in the supremely sublime Tesla Roadster Sport that you just watched. 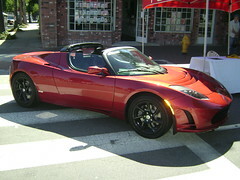 A very special thank you goes out to Benjamin M.
TESLA Roadster Ride and Lecture Luncheon. Presented at the Marconi Museum and Sponsored by TESLA - Newport Beach. Tustin, CA - Remember way back when? When the "IN" show accepted its mission to learn more about TESLA Motors? Okay, so maybe we're being a bit dramatic; but, we meant what we said about getting more information about this super-charged company. Well, imagine our excitement then, when we were informed about a TESLA Roadster Ride and Lecture Luncheon to be held the same week as the L. A. Auto Show! Knowing that there would be plenty of EV information to be had at the upcoming Auto Show, we knew we couldn't go wrong by attending this event in order to see where TESLA Motors stood in this fast growing movement. Held at the Marconi Museum and sponsored by TESLA Motors - Newport Beach, the "Ride and Luncheon" turned out quite well. First, we were very impressed by TESLA Motors' personnel. Each of them were quite personable, highly informative, and excuded a passion not only for TESLA Motors; but, also for the goal of creating a cleaner, greener environment. It's common knowledge to the auto-enthusiast and sports car afficianado that TESLA Motors is not a newbie when it comes to electric vehicles or cutting edge technology. Founded in 2003 by a group of Silicon Valley engineers, one of their primary directives was to prove that electric vehicles could be awesome. (Who doesn't remember the huge chatter when George Clooney bought one?) With Headquarters in Palo Alto, California, an employee count of over 800 people, ownership of 15 patents (and 100 plus pending), TESLA Motors has positioned the company as a tour de force in the electric vehicle movement. 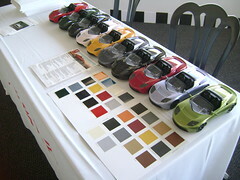 While at the Tustin Event, attendees were able to ride along in the "Roadster Sport 2.5." (there where quite a few "ohhh mannnn's" and "let's do that again!") As for the luncheon, the corresponding lecture was very informative. Kirsten shared where TESLA Motors is headed, how other companies are benefitting from TESLA's innovations, and the power that is placed in the hands of the individual when they own their own TESLA. Jeremy and Benjamin talked about the "Roadster's" features, technology, construction, and electric advantage. After attending the "Ride and Lecture Luncheon," it was clear, a TESLA Motor vehicle is not merely a showpiece meant only for the auto-enthusiast. It is a real investment for one's self and for the global community. The "IN" show strongly recommends that you find out more. Visit TESLA Motors online (go here), visit your local Showroom (find one here); and, check out GoElectricDrive.com to find out why going green is such a big deal. All around, the "IN" show was quite impressed with this event. Please, help yourself to listening in on the lecture that we enjoyed while in attendance at the luncheon and stay tuned for the "IN" show's next checkpoint: TEST DRIVE! at Pasadena's Annual Clean Air Auto Show. Pasadena, CA - While covering the Clean Air Auto Show in Pasadena, the "IN" show discovered one of the major exhibitors to be TESLA Motors; and right there for all to see, was the "Roadster Sport 2.5" in all it splendour. Striking, seemless, and willfull (yes, willfull). Just a few of the words that came immediately to mind. The "Roadster's" structure is one that has been clearly built around the driver. As for its features? Well, TESLA Motors left no job undone! With one look at this automobile, it can be said with confidence that TESLA Motors has taken the proverbial bull by the horns and is providing a truly efficient, electric vehicle. Manning the exhibit that day was a knowledgeable TESLA Motors' employee by the name of David. He graciously took the time to answer some questions and explain a few of the facts that can well be described as the "nuances of Tesla." To say the least, the "IN" show found that there was a new mission: To learn more about this incredible electric vehicle. And so, it has begun! Be sure to stay tuned and come on back because you know us, we'll post what we find and always keep you INvolved and IN the know. But before you move on, be sure to check out Dave, a top-notch man who serves TESLA well, as he talks with the "IN" show at the Pasadena Annual Clean Air Auto Show.